Well, here I am again, descending upon you from Cyber Space, and doing my best to bare my heart to you as I would if we were face-to-face. I’m very sorry that my present physical challenge has of late prevented me from roaming the planet, looking into the eyes of my brothers and sisters whom I love, and enjoying mutual edification. My job as a leader in the Body is to do all I can to help “Christ be formed in you” (Gal. 4:19). That is much more easily done via sustained personal fellowship, but for now I’ll do what I can with what I have. Paul also wrote: “He is the one we proclaim, admonishing and teaching everyone with all wisdom, so that we may present everyone fully mature in Christ. To this end I strenuously contend with all the energy Christ so powerfully works in me” (Col. 1:28-29). The last month of a calendar year is a time to reflect upon many things: our personal growth in Christ, how we have functioned as ministers in the Body of Christ, how many people we have won to Christ, the state of our closest relationships, what weaknesses do we want to become our strengths, and how thankful we are for all God has done for us and those we love. In The Living Truth Fellowship, the highlight of this year was the January release of our third major video production, Jesus Christ, The Diameter of the Ages. If you have not yet had the joy of watching it, click on the link and prepare for a 19-hour panorama of the heart of The Man Who is The Plan Because The First Man Ran. Would to God that during this month when Jesus gets more publicity than at any other time of year, every human on the planet who hungers for Truth could watch this electrifying presentation. As I have said before, that is basically what we pray for the most—an audience! Why? Because we know that if we can get in front of people with the Word we teach, many will believe it. Recent studies have shown that here in the USA, 85% of the populace gives less than 2% of their income to charity. I believe the best thing you and I can give someone is the Treasure of Truth—the Word of God, with which we have been privileged and entrusted. That is “the gift that keeps on giving.” When was the last time you eagerly shared the Word with someone? I just learned that the word generous comes from a word relating to birth (akin to genesis, generation, etc.). In the ancient Roman culture, “generous” pertained to those who were “born right.” That is, the elite, the upper crust, etc. As sons and daughters of God, you and I have really been “born right,” and thus we can, and should, be most generous. In this last FRUIT OF D’VINE of 2017, I enthusiastically ask you for as generous a year-end gift as you can give to this unique ministry, and also for your regular support in 2018. I never hold back in encouraging folks to give, because I know what the Word says about how God will richly bless those who do. By the grace of God, and even with the medical bills I’ve had the past 43 months, I have so far been able to get along without a regular salary from TLTF. All I will receive this year is the IRS-allotted Ministerial Housing Allowance that reimburses my household expenses. Up until January of 2016 I basically supported myself doing world-class comedy disguised as SAT Prep for deranged teenagers, but retired from 15 years of that after the test was radically changed and my current physical challenge was depleting my energy. So where does the money you give to TLTF go? We want to be transparent in that, and every, regard, so here’s the scoop. For the past few years, only a few more than 200 brethren have sent money to TLTF—not that large a donor base, and only one-fourth of those have given $25 a week or more. I say that first to indicate how much we value each one of our contributors, and second to emphasize how gracious God has been to provide for us to the point where we currently have enough in the bank to function for about nine months even without any further support. This month marks the end of our eighth year of operation in TLTF, which we started in 2010 “without a dime.” But thanks to the response of those brethren whom I initially solicited for support, we could then begin to pay Franco Bottley for his superb graphic arts talents. He is also our CEO, and the only one receiving fulltime pay. The only person who receives part-time remuneration is Christina Bottley, our Social Media Coordinator. Don Chamberlain (Prayer Team Coordinator) and Rosanne Martino (Bookkeeping) do a great job for us as volunteers. Currently, our next major expense will be a total revamping of our website, which we estimate to be about $35-40K. That project will begin as soon as Franco is physically able to work on it. We want our work to so touch you that you gleefully and hilariously contribute to TLTF. That is, you can barely lick the envelope because you are laughing so hard. That is the attitude described in 2 Corinthians 8 and 9, as per the following excerpts. And finally, here are a few more words the risen Lord gave to Paul for us—a clarion call describing the heart of a genuine minister of the Gospel. “Not that I desire your gifts; what I desire is that more be credited to your account” (Phil. 4:17). Yes, we need money to run TLTF, but we want you to reap the full harvest of your material giving in this life—and in the next. God and the Lord long to bless us, both now and at the Judgment Seat of Christ, as per this verse: “Such trials show the proven character of your faith, which is much more valuable than gold–gold that is tested by fire, even though it is passing away–and will bring praise and glory and honor when Jesus Christ is revealed” (1 Pet. 1:7). NOTE: All that ”praise and glory and honor” will come from JESUS to YOU! Sharing of our material possessions is a very concrete way by which we can measure both our own commitment and the degree to which God blesses us for so doing. God challenges His people to “prove Him,” so let’s “step out of the boat” and watch Him make the water firm beneath our feet. If you do support TLTF financially, you know that I personally acknowledge every gift we receive. But again, on behalf of all our TLTF leadership nucleus, THANK YOU, THANK YOU, THANK YOU!!! And if you can increase your giving for 2018 by any amount, that would be a big help. As we draw near to the Christmas celebration, consider these words: “May the God of hope fill you with all joy and peace as you trust in him, so that you may overflow with hope by the power of holy spirit” (Rom. 15:13). That sounds like what the angels proclaimed at the birth of our Savior: “great joy” to the world and “peace to those on whom His favor rests.” And of course true joy and peace are based upon HOPE. 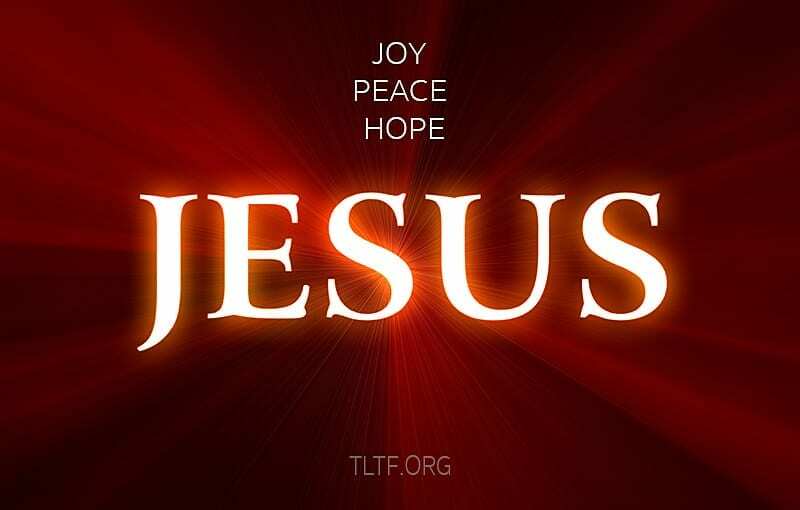 Joy has a name: Jesus! Peace has a name: Jesus! Hope has a name: Jesus!